Winter weather is just around the corner and there is no reason you can’t be ahead of the game. Keep your skin rejuvenated and smooth with some of our products we offer by SkinMedica. Our biggest tip at the Urban You is to find the best skin care regimen for you. Below are a few of our favorite products as well as a SkinMedia award winning skin care treatment. TNS Essential Serum® is an all-in-one skin rejuvenating treatment that improves the appearance of fine lines, wrinkles, skin tone and texture. This product is appropriate to use for people with any skin type. Dermal Repair Cream by SkinMedica is an ultra rich moisturizer helps prevent moisture loss and improves skin smoothness to restore your skin's natural beauty. This product provides intense skin hydration, replenishes moisture, and improves smoothness. This product is appropriate to use for people with normal to dry skin. Rejuvenating Moisturizer by SkinMedica helps nourish, hydrate, and rejuvenate skin. This product is appropriate to use for people with normal to dry skin types. Easy product to use that will keep your skin looking healthy and rejuvenated through the cold winter season. Finally, the deal you will be raving about to your friends about. 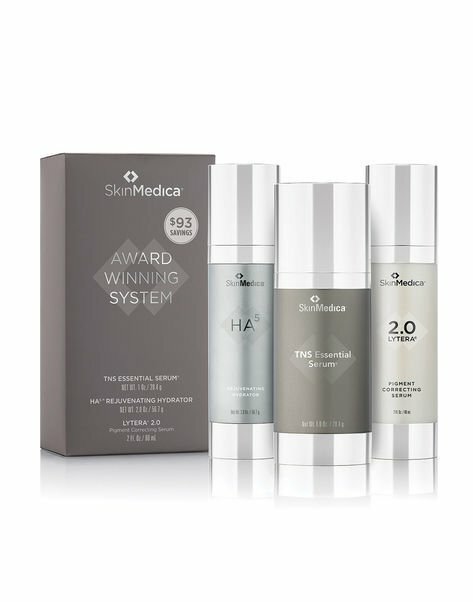 SkinMedica’s Award Winning System. This is a collection of transformational, award winning products beauty experts cannot stop talking about. This system can be your customized daily regimen by adding your other favorite SkinMedica® products for the appearance of smoother, brighter, more even-looking skin.